Making a film involving the most significant event in the lives of thousands if not millions of your compatriots is surely a risky venture – it is impossible to please an audience with such a range of experiences and recollections. Undertaking to make World Trade Center just five years after the shattering events of 11th September 2001, Oliver Stone has angered many who feel it is too early to dramatise that time, and yet he has succeeded in making an effective film that, instead of focussing on the big picture, details the impact of that day on two young families. 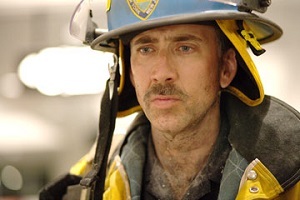 As two of only twenty people pulled from beneath the wreckage of the collapsed Twin Towers, Will Jimeno (Michael Peña) and John McLoughlin (Nicholas Cage) are the ‘lucky’ survivors of a team of Port Authority Police Officers who were among the first responders after the initial impact. Their struggle for survival within the rubble, and the appalling stress that not knowing their fate causes for their wives Allison (Maggie Gyllenhaal) and Donna (Maria Bello), provides the basis of Stone’s film. By choosing to limit himself to this story of hope, Stone tactfully avoids the more controversial aspects of the day – only occasionally does his interest in the political aspects of 9/11 surface, and for the most part he has restrained himself. The tight focus on the personal rather than the country- or world-wide reactions encourages the audience to place themselves in the shoes of his heroes, imagining (perhaps for the first time) what it really must have been like to be among those directly affected. Stone’s insistence on accessing the experience of these four people is evidenced in many directorial decisions. The planes themselves are never seen; the building collapses shown only from the perspective of those unfortunate enough to be within them. The famous footage most will be familiar with is used only in limited grabs, usually to allow the audience to gradually realise the scope of events just as the policemen do. There are several problems with World Trade Center, most particularly in the subplot involving Dave Karnes, the former Marine who eventually played a significant role in the rescue of the trapped men. Here, he is presented as a religious automaton, and one can only surmise that his real life lack of involvement with this project left Stone uncertain how to portray him. Alongside this difficult characterisation, the over-use of some film techniques distracts from the personalisation of the experience. Flashbacks and dream sequences abound, and purely from a film-watching point of view, they diminish the power of the storyline. This illustrates the main tension of watching a film like World Trade Center… purely as a film, it is at times manipulative and sentimental, and there are filmic clichés scattered throughout. However, the close involvement of the four main figures portrayed in the making of the film suggests that much of their experience is accurately told, and thus if dream sequences and flashbacks were their experience, they are entirely valid. This conflict is difficult to resolve, as at times one reacts with disbelief that Stone could be so corny, and yet this response may be unjustified. Telling the story of survivors from their point of view, Stone has fashioned a moving and emotional experience for those of us who may never have considered the events of 9/11 from this angle. Intelligent directorial choices, albeit with a touch of sentimentality creeping in, leave World Trade Center far better than many may have feared, although it is unlikely to satisfy everyone. This entry was posted in Film Reviews and tagged Drama, Period Drama by Mark Lavercombe. Bookmark the permalink.